Local Churches make a Big Difference! For Serve Day 2014, churches all over the Sacramento area closed their doors and left the building for a weekend, giving the members an opportunity to quite literally practice what they preach. 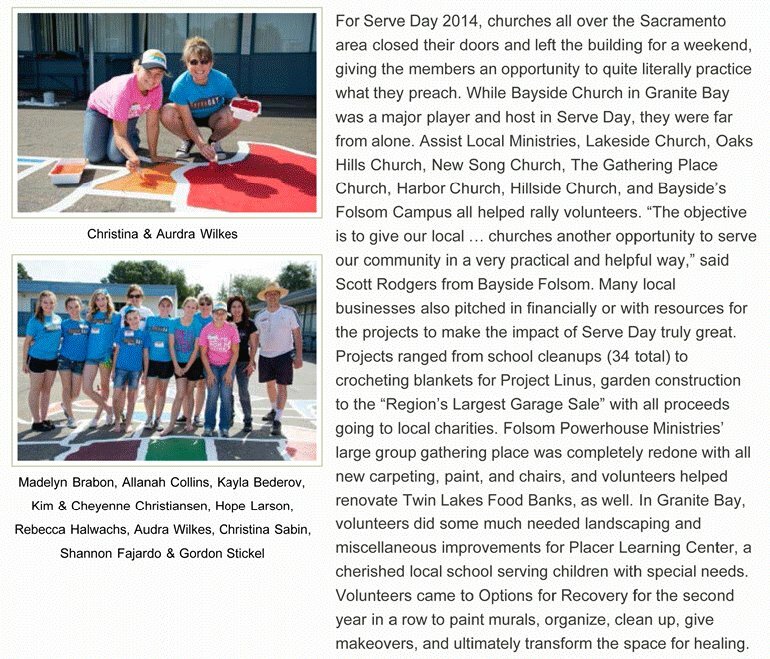 While Bayside Church in Granite Bay was a major player and host in Serve Day, they were far from alone. Assist Local Ministries, Lakeside Church, Oaks Hills Church, New Song Church, The Gathering Place Church, Harbor Church, Hillside Church, and Bayside’s Folsom Campus all helped rally volunteers. “The objective is to give our local … churches another opportunity to serve our community in a very practical and helpful way,” said Scott Rodgers from Bayside Folsom. Many local businesses also pitched in financially or with resources for the projects to make the impact of Serve Day truly great. Projects ranged from school cleanups (34 total) to crocheting blankets for Project Linus, garden construction to the “Region’s Largest Garage Sale” with all proceeds going to local charities. Folsom Powerhouse Ministries’ large group gathering place was completely redone with all new carpeting, paint, and chairs, and volunteers helped renovate Twin Lakes Food Banks, as well. In Granite Bay, volunteers did some much needed landscaping and miscellaneous improvements for Placer Learning Center, a cherished local school serving children with special needs. Volunteers came to Options for Recovery for the second year in a row to paint murals, organize, clean up, give makeovers, and ultimately transform the space for healing. Altogether, more than 6500 volunteers participated in 143 projects in cities across the region this year, impacting approximately 129,100 people with 24,890 hours of service. Zoom Roseville is your local online resource for Events in Roseville, Rocklin, Granite Bay, Loomis & the Lincoln area. 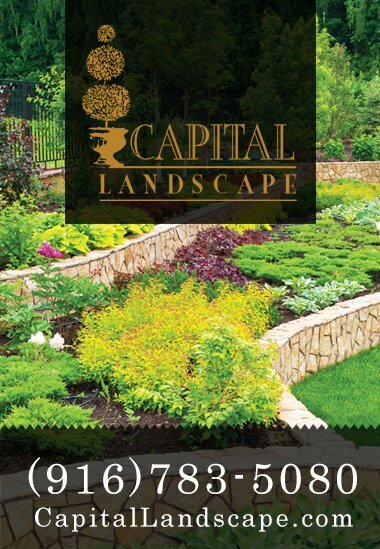 We cover many past events and upcoming events in Roseville, Rocklin, Granite Bay, Loomis & Lincoln area as well. If you would like Zoom Roseville to cover your event, just fill out our contact form and someone will be with you shortly. Thanks! Next ArticlePercy the Fire Dog to the Rescue! Fire up the grill in style with a concrete countertop outdoor kitchen! Seldom, we send out newsletters and updates for what is going on in the community. This includes anything from up-coming events, amazing new things to do and featured businesses. There is a lot happening in the Roseville/ Rocklin/ Granite Bay area, lets stay connected. Sign up and start getting involved in our community!